Arsenal fans hold various banners as the players complete a lap of appreciation. ARSENAL MANAGER ARSENE Wenger said an “absolutely horrendous” atmosphere had been partly responsible for his club’s failure to secure a Champions League place for the first time in 20 years. Speaking after a 3-1 victory over Everton on the final day of the Premier League season, Wenger accepted that uncertainty over his future as manager, which has divided fans, had polluted the air at the Emirates Stadium. He said there were other explanatory factors behind the club’s difficulties, but refused to go into greater detail. “Overall I believe that we played since January in a very difficult environment for different reasons,” Wenger told reporters at the Emirates on Sunday. “Some obviously that you know about and that is very difficult for the group of players to cope with that. Some other reasons, where we will talk about another day. Wenger said earlier this year that he would make an announcement about his future before the end of the season, but he has repeatedly ducked opportunities to reveal his intentions. The 67-year-old would only say say his future would be sorted out “soon”. With Arsenal having finished fifth in the league, attention now turns to Saturday’s FA Cup final against Chelsea, when victory would give Wenger a record seventh success in the competition. But he will be missing Laurent Koscielny after the French centre-back was sent off for a rash challenge on Enner Valencia and also expects to be without Gabriel, who was stretchered off with a knee injury. Arsenal’s 10 men prevailed courtesy of goals from Hector Bellerin, Alexis Sanchez and Aaron Ramsey, with Romelu Lukaku replying from the penalty spot. Wenger suggested his decision not to take part in the post-match lap of appreciation had been influenced by fears of a negative reaction from fans. “The players, they have been disturbed enough,” he said. 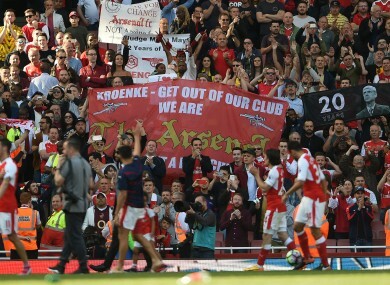 Wenger also said Arsenal’s supporters’ protests against shareholder Stan Kroenke — who was loudly and repeatedly told to “get out of our club” — were misplaced. “I think you respect everybody in life. I respect Stan Kroenke a lot,” Wenger said. Everton playmaker Ross Barkley, who is stalling over a new contract, came off the bench to replace Tom Davies as part of a 26th-minute reshuffle by visiting manager Ronald Koeman. Koeman said his decision to leave Barkley out had nothing to do with his contract situation, but said he expected to be able to make an announcement about the England midfielder’s future imminently. “I will speak to the board tomorrow and we will make a statement about that,” said the Dutchman, whose side finished seventh and will enter the Europa League next season. On his ambitions for the close-season transfer window, Koeman said: “First of all we need more numbers in to be prepared for a long, tough season with different competitions. Email “Arsenal hurt by 'horrendous' atmosphere - Wenger”. Feedback on “Arsenal hurt by 'horrendous' atmosphere - Wenger”.